The Villa d'Este was built on the site of a Benedictine monastery. It was intended for entertaining and contains lavishly frescoed reception rooms. The main attraction for visitors, however, is the breathtaking garden. 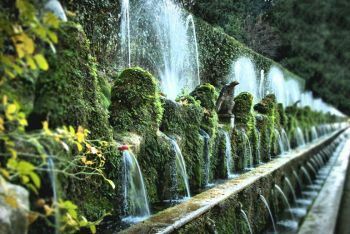 Designed to impress the Cardinal's guests, the Villa d'Este's gardens are composed almost exclusively of water features. Fountains of every description dazzle the onlooker, from the grand 'Fountain of the Dragons' and 'Hundred Fountains', to a miniature watery reproduction of Rome. 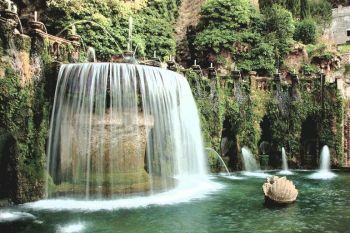 The centrepiece, the gigantic Water Organ Fountain, cascades down a huge drop into quiet, shady pools. 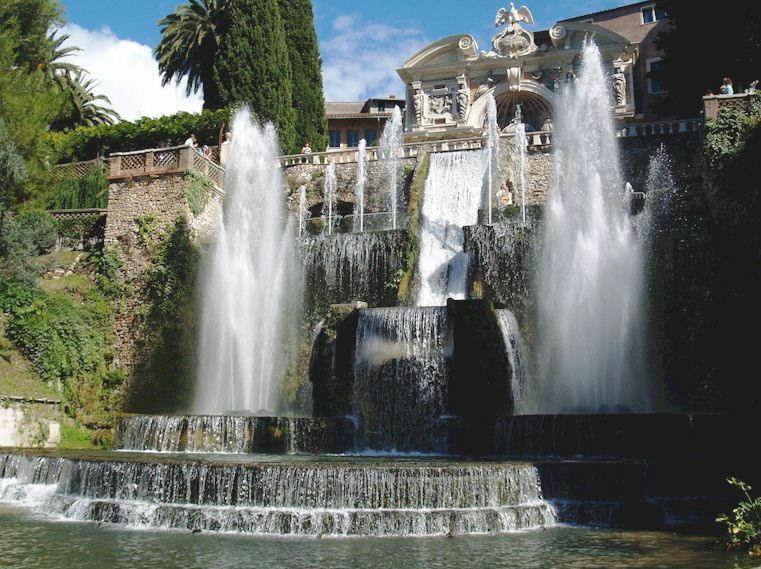 The Villa d'Este is the main attraction of Tivoli and one of the most interesting architectural and horticultural constructions in a country full of fine villas and gardens. It should not be missed by anyone touring the Roman Campagna. Cardinal Ippolito II d'Este (1509-1572) was the son of Alfonso I d'Este and Lucrezia Borgia and grandson of Pope Alexander VI. He was appointed Governor of Tivoli by Pope Julius III, a position that included the ownership of the villa. To evoke the magnificence of the courts of Ferrara, Rome and Fontainebleau in the Villa d'Este, he had the villa and its grounds entirely reconstructed according to the design of Pirro Ligorio and under the direction of the Ferrarese architect-engineer, Alberto Galvani, court architect of the Este. The chief painter of the ambitious internal decoration was Livio Agresti from Forlì. From 1550 until his death in 1572, when the villa was nearing completion, the Cardinal created a palatial setting surrounded by a fabulous terraced garden in the late-Renaissance mannerist style, which took full advantage of the dramatic slope but required innovations in bringing a sufficient water supply, for the cascades, water tanks, troughs and pools, water jets and fountains, giochi d'acqua. Drawing inspiration (plus many statues and much of the marble used for construction) from the nearby ruins of Hadrian's Villa and reviving Roman techniques of hydraulic engineering to supply water to a sequence of fountains, the cardinal created an elaborate fantasy garden whose mixture of architectural elements and water features had an enormous influence on European landscape design. Pirro Ligorio, who was responsible for the iconographic programmes worked out in the villa's frescoes, was also commissioned to lay out the gardens for the villa, with the assistance of Thomaso Chiruchi of Bologna, one of the most skilled hydraulic engineers of the 16 C. At Villa d'Este he was assisted in the technical designs for the fountains by a Frenchman, Claude Venard, who was an experienced manufacturer of hydraulic organs. For Hotels in Tivoli and neighbouring towns, click here. In the 18 C, the villa and its gardens passed to the House of Habsburg and were neglected. The hydraulics fell into disuse, and many of the sculptures commissioned by Ippolito d'Este were scattered to other sites. The picturesque sense of decay recorded by Carl Blechten and other painters was reversed during the tenure of Cardinal Gustav von Hohenlohe. The Villa itself surrounds on three sides a 16 C courtyard sited on the former Benedictine cloister. The fountain on a side wall, contains a sculpture of a sleeping nymph in a grotto guarded by d'Este heraldic eagles, with a bas-relief framed in apple boughs that links the villa to the Garden of the Hesperides. The central main entrance leads to the Appartamento Vecchio, the "Old Apartment" made for Ippolito d'Este, with its vaulted ceilings frescoed in secular allegories by Livio Agresti and his students, centred on the grand Sala, with its spectacular view down the main axis of the gardens, which fall away in a series of terraces. To the left and right are suites of rooms, that on the left containing Cardinal Ippolito's's library and his bedchamber with the chapel beyond, and the private stairs to the lower apartment, the Appartamento Nobile, which opens directly onto Pirro Ligorio's Gran Loggia straddling the gravelled terrace with a triumphal arch motif. The garden plan is laid out on a central axis with subsidiary cross-axes of carefully varied character, refreshed by some five hundred water jets in fountains, pools and water troughs, supplied by the Aniene, which is partly diverted through the town, and by the Rivellese spring, which supplies a cistern under the villa's courtyard. The Villa's uppermost terrace ends in a balustraded balcony with a sweeping view over the plain below. Double stairs flanking the axis lead to the next garden terrace, with the Grotto of Diana, richly decorated with frescoes and pebble mosaic to one side and the central Fontana del Bicchierone ("Fountain of the Great Cup") attributed to Bernini, where water issues from a seemingly natural rock into a scrolling shell-like cup. 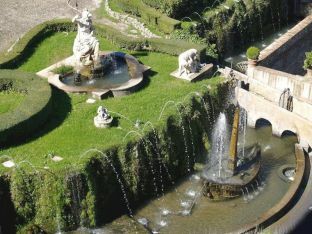 The Fontana dell'Ovato ("Oval Fountain") cascades from its egg-shaped basin into a pool set against a rustic nymphaeum. To descend to the next level, you take stairs at either end - the elaborate fountain complex called the Rometta ("the little Rome") is at the far left - to view the full length of the Hundred Fountains on the next level, where the water jets fill the long rustic trough, and Pirro Ligorio's Fontana dell'Ovato ends the cross-vista. It is possible to walk behind the water through the rusticated arcade of the concave nymphaeum, which is populated by marble nymphs by Giovanni Battista Della Porta. Above the nymphaeum, the sculpture of Pegasus alludes to the fountain of Hippocrene on Parnassus, haunt of the Muses. This terrace is united to the next by the central Fountain of the Dragons, dominating the central perspective of the gardens, erected for a visit in 1572 of Pope Gregory XIII whose coat-of-arms features a dragon. 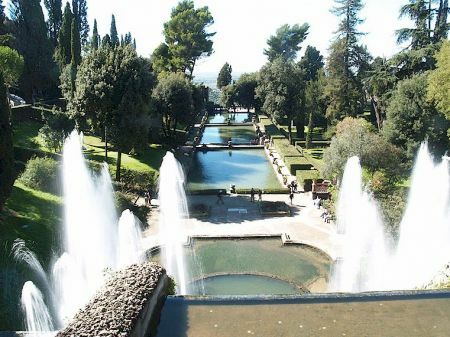 Central stairs lead down a wooded slope to three rectangular fishponds set on the cross-axis at the lowest point of the gardens, terminated at the right by the water organ and Fountain of Neptune.